There is a dinosaur on board the International Space Station where there wasn't one before. 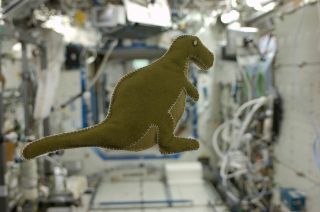 NASA astronaut Karen Nyberg, who since May has been working as a flight engineer as a member of the orbiting outpost's resident crew, revealed the toy dinosaur floating on the space station on Thursday (Sept. 26). The dinosaur, which resembles a Tyrannosaurus Rex, has an olive green back and a lighter green belly. It is stitched together with white thread. Nyberg, a self-described crafter whose hobbies including quilting and sewing, packed threads, sewing needles and small fabric samples for her trip to space. But to make the dinosaur, she scavenged materials that she found around her orbital home. "It is made out of velcro-like fabric that lines the Russian food containers [that are] found here on the International Space Station," Nyberg wrote about the doll. "It is lightly stuffed with scraps from a used t-shirt." NASA astronaut Karen Nyberg, Expedition 37 flight engineer, poses for a photo while floating freely in the Unity node of the International Space Station on Sept. 16, 2013. Astronauts have carried stuffed dolls to space before, and cosmonauts have a tradition of launching with small plush toys as talismans and "zero-g indicators." When the dolls, which are suspended from the Soyuz spacecraft's control panel, begin to float, the crew can tell they have entered orbit. Nyberg's crew launched with a plush white dog her Soyuz commander, Fyodor Yurchikhin, had received as a gift 30 years ago and had flown into space twice before. A small black cat doll, named "Dimlar," served as the zero-gravity indicator for the crew that arrived Wednesday (Sept. 26), named after cosmonaut Oleg Kotov's children, Dima and Lara. Nyberg's dinosaur however, may be a new breed of space toy. It may be the first stuffed animal created in space. In addition to sewing stuffed toys for him, Nyberg keeps in daily contact with her 3-year-old son Jack, sending down short videos for him every day. Nyberg's husband, who is also an astronaut who last flew on the final space shuttle mission in 2011, sends up photos and videos of their son. A photo Nyberg earlier shared on Pinterest revealed that Jack has his own handiwork in space, too. Hanging on the wall of her quarters is an orange and pink painting labeled "For Mommy." Nyberg is slated to return to Earth on Nov. 11, presumably with the toy dinosaur in tow. Follow collectSPACE.com on Facebook and on Twitter at @collectSPACE. Copyright 2013 collectSPACE.com. All rights reserved.